With Brett Favre finally reporting to Minnesota earlier this week, I think we all assumed everything in Minnesota would be smooth sailing until January, when Favre throws four picks in the final two minutes and Brad Childress calls six punts from inside the opposing 10-yard line to mark yet another horrendous playoff defeat. That’s just what the Vikings do, you know. That’s how they are. “Brett thinks Childress has no clue about offense,” a Vikings player said. “Brett just doesn’t trust him,” a player said. Some players believe that most of the offensive coaching staff is made up of yes-men like Bevell. Furthermore, Childress is the type who doesn’t take outside ideas very well. As someone who follows this team closely, I can tell you that Favre’s feelings about Childress are pretty much the exact same feelings every Vikings fan has about the Vikings head coach. Until Favre arrived, this was an absolutely horrendous passing offense, and it’s clear that Favre’s audibles during the two-minute drill represented a vast improvement over Childress’ play calls in similar situations in the past. Favre makes Childress look better, and to say otherwise is disingenuous. If you recall Favre’s retirement drama from LAST year (and really, they’re starting to all blend together), you may remember that one of the reasons Favre decided to come back was because of Childress. Specifically, Childress’ offense, which Favre knew intimately, and well enough to not require preseason training of any sort. This was the same offense Childress had been preaching as “kickass” (his word) for years, only to have nothing to show for it. It wasn’t until Favre arrived that Childress’ offense finally looked like something appealing. So, taking all that into account, the obvious conclusion is that Favre is RIGHT about Childress. Yes, Favre threw a horrid pick at the end of the NFC title game, but it was Childress who ruined the game by trying to settle for an unreasonably long field goal and getting caught in a 12-man penalty before Favre’s pick went down. That was Childress’ doing, and he saddles as much blame for that brutal ending as Favre does, if not more so. And I say that as someone who enjoys blaming Brett Favre for virtually all of the world’s ills, even Autotune. The problem with Favre being right about Childress is that it makes his comeback this year look all the more disingenuous. He said he “owed it to the Vikings.” He said he wanted one last shot at helping them try to win the Super Bowl. Those words struck me as incredibly pedantic. Oh here! I’ll come back and RESCUE you, you poor Minnesota masses. I suppose I can swoop in and grace you with my presence one final time. 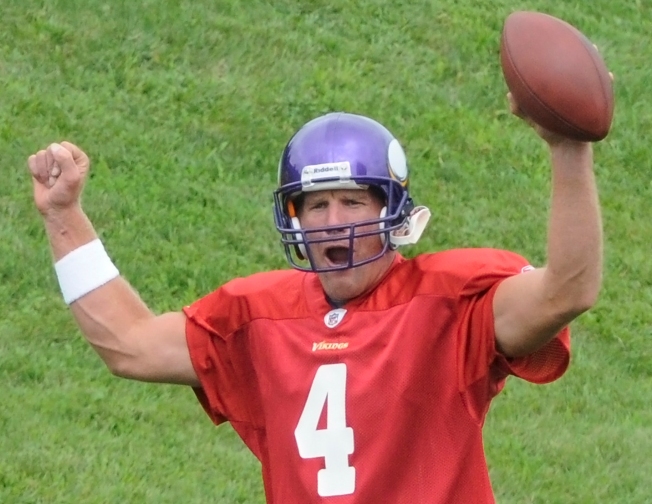 This is all so Favre can supposedly gift a final title shot to his teammates. But he knows who’s in charge. He knows, deep down, that Brad Childress is the kind of coach who will never win a Super Bowl, regardless of how talented his roster is. And if Favre knows that, then why did he really come back? Well, I think you already know the answer to that. I don’t expect Favre and Childress’ relationship to be this team’s undoing. I think their undoing is inevitable somewhere down the road regardless. That’s just what happens when you entrust a team to these two particular men.